Classical musicians of all kinds have a tendency to emphasize their pedigree as much as possible, citing illustrious mentors and collaborators as the easiest way to establish their credentials. In the second part of the twentieth century, it seemed as any guitarist hoping to “make it” needed first to secure Segovia’s stamp of approval—a process that was not necessarily failsafe, as it gave us many first-tier artists as well as the great Esteban. Pianists and violinists can aim for longer-reaching (and perhaps loftier) pedigrees—I have met a couple of musicians who could boast a pretty much direct lineage from the likes of Johannes Brahms and Clara Schumann. 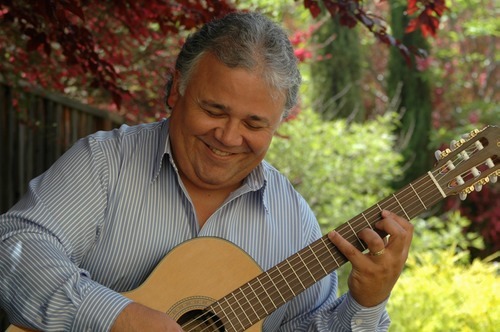 Guitarist Julio Reyes studied guitar with his father, a native of Paraguay who came to America as cultural ambassador. Carlos Reyes had been a student of Dionicio Basualdo—a pupil and friend of Agustin Barrios, as shown by the dedication his Vals Op. 8 No. 4. However remarkable, such pedigree would mean little unless accompanied by convincing performances; fortunately, Reyes’s debut recording Heart Strings delivers. The disc contains thirteen compositions among Villa-Lobos, Chopin, Lauro, Carlos Reyes, and of course Agustin Barrios, the most represented with eight tracks. Reyes’s plays sensitively and with exquisite musicianship. Never hurried, never strained, his technique seems to exist only to serve the underlying musical meaning. I was not overly surprised in hearing his deliberate and convincing phrasing, as I knew that Reyes is also an experienced conductor, having served as an assistant to Kent Nagano in the 1980s and 1990s, as well as having directed the second performance of Joseph Redding’s opera Fay Yen Fah (which was premiered, and then rapidly forgotten, in 1925). As I listened to Reyes’s performances, I heard a musician who just happened to play the guitar, and that helped instill some new life in the well-known and often-heard repertoire. His appropriately slow and longing interpretation of Barrios’s classic Julia Florida was a favorite of mine. The one track that is completely novel is the premiere recording of Gratitud by Carlos Reyes, a warm vals dedicated—you guessed it—to Dionicio Basualdo. The short and charming composition is both inventive and idiomatic, and I would hope to see it published sooner rather than later. About the only fault I can find with the recording is the less than stellar sound quality. There is a noticeable hiss underscoring each track, and becoming especially distracting in the quieter passages. I am also not crazy about the quality of the treble sound, whereas the low- and midrange strike a good balance between clarity and warmth. Conversely, these sonic characteristics contribute to giving the recording a character of yesteryear, especially combined with Reyes’s decidedly vintage phrasing. I would be happy to trade such minor audio quibbles for the deliberate and mature musical expression that Reyes conveys throughout this recording. Presently Julio Reyes keeps busy teaching, performing, and lecturing on the interpretation of the music of Barrios. I heartily recommend checking out his honest and beautiful work; aside from the sheer pleasure derived from listening, there is much to learn on a musical and interpretive level from every aspect of his playing. Heart Strings is available on iTunes and Amazon.com Audio samples and other information can be found on julioreyesguitarist.com. The opening to Julia Florida in the bass is gorgeous but the treble is scratchy and thin IMO. I listened to some other live recordings of Mr. Reyes and all were plagued by a lot of scratchy treble work. It’s a shame really because he is obviously incredibly gifted in his interpretation ability. I really appreciate your imput. I’m just curious which live performances you’ve heard. I’ve changed guitars since the recording and I feel that treble issue has ended. Send me an email info@julioreyesguitarist.com and I’ll let you know when I perform next. Hopefully, you’ll hear the difference. Thanks, again.